made the opposable thumb version using rep 2 and skin Filaflex. a bit hard to push the cable. 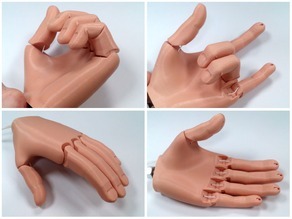 i think that the part where the finger connects to the palm is too soft so when you pull the wire mostly the lower hinge bends. The lower hinges indeed close easier and therefor before the finger hinges, that is until resistance is met, then the upper part of the fingers continue to wrap around the object, thus, each finger can conform to an irregularly shaped object. I actually used small bore PTFE liner (2mm OD 1mm ID) to line the tendon channels in the body to reduce tendon friction.